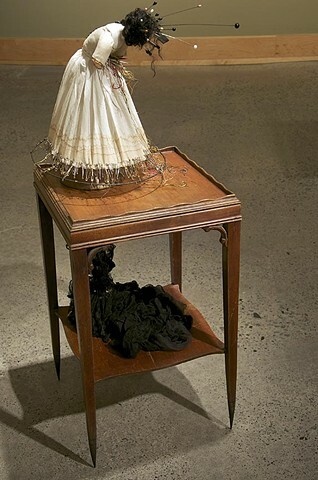 This striking pinned effigy was found standing upright on the floor of the attic of a former brothel in the infamous Storyville section of New Orleans after the floods of Hurricane Katrina subsided. Legend has it that Eugenie Grey, an unstable “working girl,” known to all as “Genie,” was banished from the main house and forced to live in the attic since she was such a troublemaker. Ahe took out her grievances on her enemies, real or imagined, by stealing a lock of their hair that would then be used in the creation of her powerful voudou objects. This particular doll was meant to induce headaches and intestinal distress.